with their tractors. We were soon sorting tractors into their groups and the stand was looking good Margaret soon had a cup of Yorkshire tea brewed to wash the dust down. Saturday arrived and an early start, by 11am sixty five tractors were on our stand and lots more arriving on wagons, then within five minutes the heavens opened and it poured down, everyone ran for shelter and there they stayed, by two o clock it was looking serious and the rain got worse at three o clock after a meeting with the Newby hall management a sensible decision was reached and an announcement told us that no tractor movements were to take place until Sunday four o clock. This was the correct decision and nobody wanted to see the beautiful parkland chewed up and put future shows in jeopardy. So Sunday arrived and so did the sun, a beautiful day followed and the crowds flocked in. There was huge interest in our display and many new members were signed up, old and new faces stood around discussing the merits of some stunning tractors especially two ford countys that were better than new. Thanks must go to all the members and exhibitors for their patience in the extreme weather conditions and commiserations to the members who did not get a chance to unload their tractors, many thanks also to Derek and Margaret Badham who supplied endless cups of tea all weekend. Grateful thanks also to Newby Hall and their Management Team. 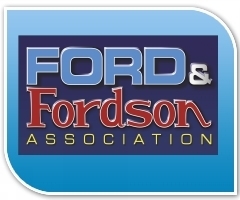 I hope everyone returns in 2015 and makes it a record show for Ford and Fordson.